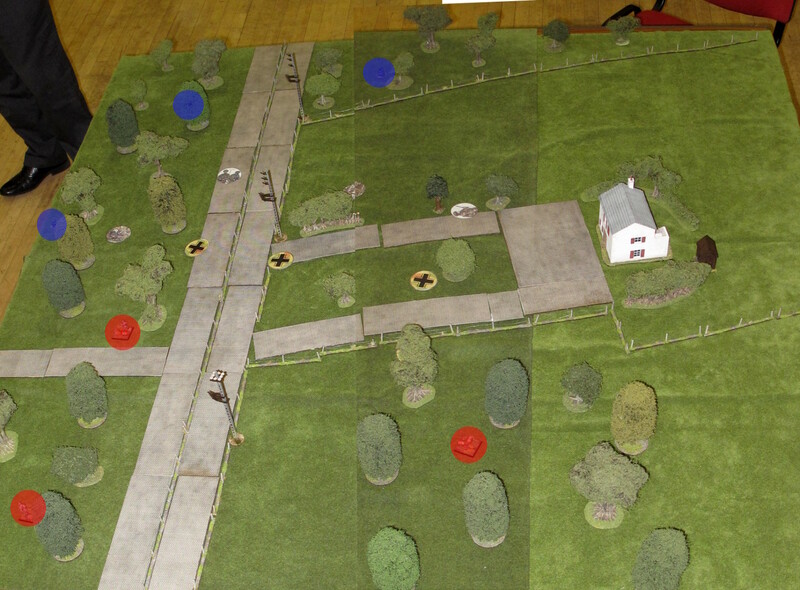 The first game in this campaign represents the lead elements of 3 Para bumping into patrols from Kampfgruppe Krafft along the Utrechtseweg road. 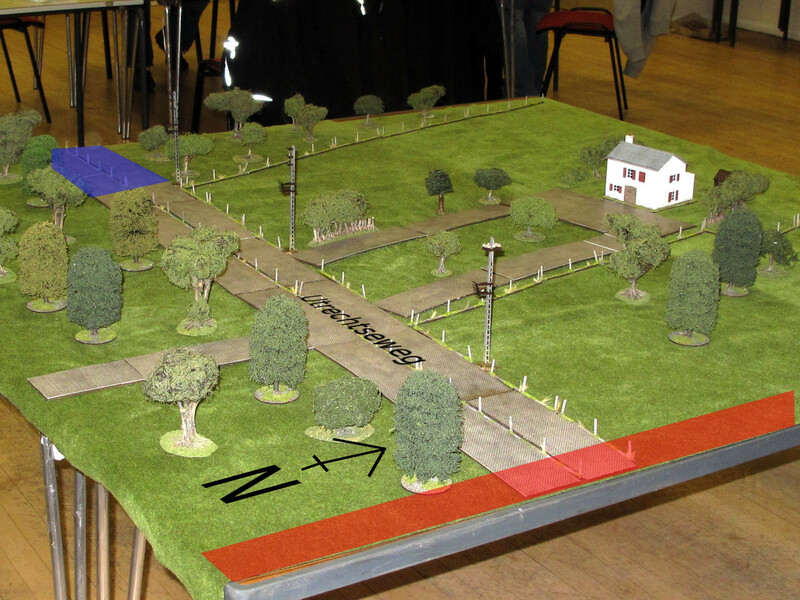 The scenario was a standard patrol game straight out of the Chain of Command rulebook. I played as the Germans, with the Paras ably commanded by Phil Turner. As this is the first game both sides are at full strength. After rolling for support and taking into account the huge difference in force ratings the Paras would get 3pts, and the Germans a whopping 13pts. The Germans opted for an extra regular squad, a second senior leader, an 8cm mortar battery on call, a sniper and a medic. I completely forgot to ask Phil what he’d picked after the game, but I didn’t see it on-board. He may have expected armour in that 13pts and bought a spare PIAT? The strategic objective for the British in this campaign is to push eastwards along the Utrechtseweg towards Arnhem. British deployment zone in blue, Germans in red. The woods at the southern edge of the table come right up to the edge of the roads, with smaller woods on the eastern and western table edges. The centre is largely open ground and a farmhouse. The patrol phase started with the British on the road. The Germans decided the battle would be won or lost in the woods along the road and deployed similarly. The patrol phase ended with both sides in close proximity in the woods, with patrol markers spread out into the open enough to allow troops on overwatch to deploy into the treelines and dominate the open ground in the centre. German JoPs in red, British in blue. British force morale started on 9, German on 8. My intention as the German commander was to engage the British and try to inflict casualties without risking my core platoon. I intended to deploy my support section as bait, then use my sniper and mortars to put some hurt on the advancing Brits, and withdraw before getting drawn into an attritional battle where the Para’s superior quality would put me at a disadvantage. The British kicked off and immediately deployed a section into the woods by the road, close to the German JoP. However, instead of advancing on the JoP Phil put them on overwatch. This effectively ruled out an offensive move on my part, as my guys would get cut down as soon as they came with the 12″ visibility limit in the woods. In response the Germans deployed their extra section, but wary of the Brits on overwatch in the woods elected to deploy across the road and also put their troops on overwatch. I then rolled another two consecutive phases, but wasn’t able to do anything more useful than deploying another section and the platoon CO into the central wood and start to move tactically to the treeline. Calm before the storm. Looking southwest across the table. Both sides deploy in the woods south of the main road, with a smaller road separating them. The British weapon section deploys. The Bren team carefully probes up to the edge of the woods. Both sides commit their squads and a firefight develops. The British moved a Bren gun team tactically up to the edge of the woods, and the Germans on overwatch duly let rip, causing relatively little damage. The Bren gun replied and using a double phase the rest of the Para section came up and a short-range firefight between two full sections developed across the road. My intention was to support this fight with mortars, the sniper and MG42s, but I’d rolled very few 1s on my command dice so far. The sniper was nowhere to be seen, and the mortar observer had been slow to deploy and only now began to call down ranging shots (the barrage needed to be precise to avoid plastering my own boys). In the meantime Phil rolled three more consecutive phases and his section battered the German blocking force mercilessly. Casualties and shock began piling up, but the unit held. I deployed another section into my main position, where they could fire in support of the firefight and 7.92mm bullets began hitting the British in their flank. Somewhere in the confusion my sniper also turned up and put some useful shock on the Brits. By now the British had taken a couple of dead in the section and their JL had been wounded, but the presence of the platoon CO had managed to keep their shock count very low. The last British section deployed along the road further back from the firefight and began working their way into the treeline as the weapon section put some fire into the German main position. The superior British command dice and the presence of their SL had really begun to tell in the brutal short-range firefight and the German section was getting obliterated, but a lucky second wound on the para section’s corporal meant he was killed, leaving the lieutenant to command the section. The British eventually rolled up enough 5s to build their first chain of command dice, and immediately played it to end the turn, capturing the German JoP they’d been sitting on for a while. The German mortars pin the British advance, and the rest of the force withdraws. At about the same time the German mortar spotter found the range and dropped a ranging shot onto them, killing a man, but in the next British phase the opposing section had finally had enough, and broke. They were down to a 2-man gun team and the section leader, who was miraculously uninjured. This actually made life easier for the mortars, who happily stonked the victorious Paras and their lieutenant in their next phase. The German mortars fire for effect. German survivors flee while the mortars have the Paras pinned. The surviving British section from the main firefight. Still 6 men out of 10 standing. Note the stoic platoon CO at the back, still drinking tea while the mortar bombs land around him. The bulk of the German force in the eastern woods, just before they pulled out. This shut down the entire southern flank, there was no way the British could advance through a barrage. This left the fight centred around the open ground in the centre, with both sides lurking in the treelines and trading fire a about 150-200m range. A few light casualties were caused, but neither side was obliged to try crossing the open ground. At this stage I would have liked to hold the British in position for a few phases and let casualties from the mortar barrage accrue, but time was running short to wrap the game up. I still had a fresh undeployed section, but I was down to 5 force morale and one of my section leaders was unconscious. I had the troops to engage the two active British sections, but not the command resources to pull off an advance across open ground against them. Getting down to 4 command dice or less while in the open facing three Bren guns and a sniper could go very wonky. Given that I’d achieved my objective of inflicting some casualties (though not as many as I would have liked) I felt it was time to withdraw in good order. The Germans melted away, leaving the British to advance down the road to the next game! The British had lost three men and a junior leader killed, but ended the game on 6 morale. Being the victors their one point morale advantage reduced the casualties to 2 men + JL. That section’s lance corporal would stand in as a replacement junior leader with 1 command initiative in the next game. One rifleman was dead and one would miss the next game. The Germans had lost 7 men from their section involved in the close range firefight, but this was a support section, so casualties weren’t tracked. The core platoon had lost 3 men and one JL had been wounded twice, so would miss the next game. One man was dead, and two plus the JL would miss the next game. The German company CO was clearly not happy, and docked the platoon commander one point of opinion, but the men were happy with the light casualties in their platoon (ie: no change). Luckily it was a support section that had taken the biggest battering (7 dead) and the men are pretty unfussed about casualties from other units. The platoon CO’s outlook stayed steady at “Secure”. This was just a minor skirmish, after all. On the British side the higher-ups were pleased and boosted their opinion by +1. The men were also pleased they’d managed to stuff more Germans than their own platoon had lost, and buffed their opinion of their tea-drinking commander by +1. Don’t rely too much on supports that deploy on a 1. If you don’t roll 1s on your command dice they won’t show up. My mortars and sniper were too slow, and by the time they’d got into action the British had murdered the section they were supposed to be supporting. Phil is bloody jammy at rolling double sixes. In the main firefight my section probably got off about half as many shots as the Brits facing them. Any elite force with six command dice is a lot more likely to roll double sixes than a regular force. This further tips the balance towards the elites in a one-on-one fight. You need to create local superiority to beat them. Don’t be afraid to hold your JoPs back deep if you’re not planning on advancing. My most forward one didn’t really achieve anything except enticing the British forward into action. I wasn’t able to defend it well enough and was lucky it only cost me 1 hit to force morale when it vanished. The next game is a probe scenario, with the British meeting Kampfgruppe Krafft’s outer pickets and looking to force their way through. Look out for the surprise appearance of General Kussin!